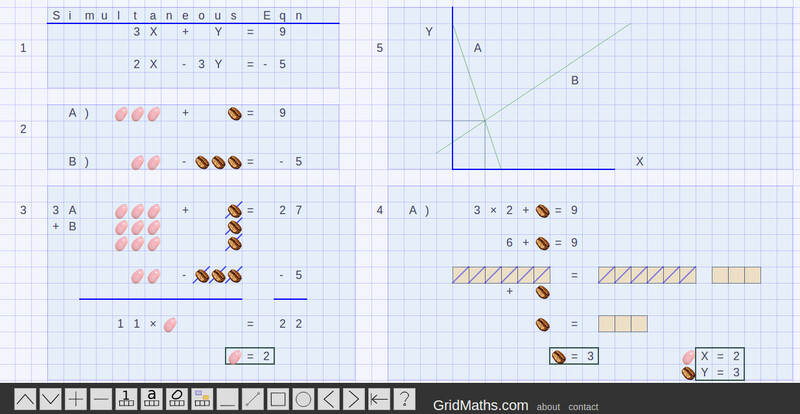 You are currently browsing the category archive for the ‘gridmaths’ category. I was discussing with other parents online, about the merits of various school Math multiplication approaches. In the “Japanese Line method” you draw lines for each digit, and then count the intersections and add them up. In the “Box-Method” you draw areas for each sub-product, and in “Longhand Multiplication” you just use the square grid to keep track in a table, without use of a diagram. The above example, which does the same problem in 2 different ways, shows the kind of approach Jo Boaler recommends, called “Number Sense” – where students are encouraged to find their own way of doing a math problem. The idea is that there are many valid ways to do it, and struggling to find your own way is a good thing [ even if you fail ], and students tend to engage more, and certainly recall more when they have actively discussed with other students. A MathCircle is where a group of young people get together and work on some interesting Math-related topics introduced by a mentor. The topics are sometimes problems like you find on ArtOfProblemSolving.com or Math Competitions [ vis AMC Sample Questions ]. They can cover quirky topics that aren’t normally seen in the school curriculum, such as Catalan Numbers. The idea sounds geeky, and is un-apologetically so, yet has the potential to engage students who might be bored with the traditional material. It preps interested students for careers in science / finance / medicine / engineering and helps the school do well in math and science competitions. Math Circle meets can also be a lot of fun. MathCircle takes the same approach of intensive practice which you find in Basketball practice, Dance club, Swim meet or musical instrument group … except focused on math-related skills. One important aspect that both Math problem solving and programming share is the sustained concentration on one task – in my opinion we have gone too far in the direction of byte size chunks of learning. Sometimes you need to chew on things for a while. We can look at how Basketball and Music are learnt, and apply what works to math. Training sessions often last for 2 hours, and this is accepted as a social norm – it is well understood it takes time to get into the zone.. repeat the basics, introduce a new skill, practice it, and integrate and perfect it over time thru a range of scenarios. Its also not about the one or two elite players – the whole team improves and transfer skills around and offer peer-support thru the shared activity. It can help develop individual qualities that are useful for success in other areas of life, namely ‘character’. MathCircle is something most parents haven’t heard of .. but teaching young people how to program is an easy sell – it has had a lot of positive marketing over the last year or so, and its a clear pathway to a good salary. I also think that writing small programs is a great way to introduce and discover math ideas .. its tactile, interactive, hands on, iterative, experimental. Your also working with the real concepts – a lot of educational apps and games seem to win in terms of engaging and entertaining, but lose in terms of conveying deeper ideas. When your making a program you are really tinkering under the hood with the engine, not just zooming around the racetrack. So a MathCircle with an emphasis on making your own programs to investigate math topics, and using tools like Geogebra, might work really well. A MathCircle which has a code-things-up emphasis, we could call a MathCodeCircle. Distributive Rule is understanding rectangles. I get the feeling a lot of people are surprised when they find out you can _understand_ math.. it isn’t just a series of random facts and some Rube Goldberg machinery. After a couple of these diagrams you can mention it works for any rectangle with sides of length a+b and c+d , namely : (a+b)(c+d)=ac+ad+bc+bd. Maybe with tablet computers we can make Math more intuitive, when good visualizations can be seen by most students. I wonder if teachers are so constrained to teach the points of the curriculum, handle admin tasks and control the class, that there is no time left for cultivating Math ‘understanding’ ? But surely its faster to learn / teach by understanding? There are 100 chickens and rabbits altogether. The chickens have 80 more legs than the rabbits. How many chickens and how many rabbits are there? In GridMaths there are a couple ways to approach simultaneous equations visually – sometimes you might use a different color bean to represent each variable, lets say an orange jellybean and a brown coffee bean, and you don’t know how much each weigh, but you might be able to figure it out. This is nice, as your not tempted to add apples and oranges together [ or jellybeans and coffee beans ]. 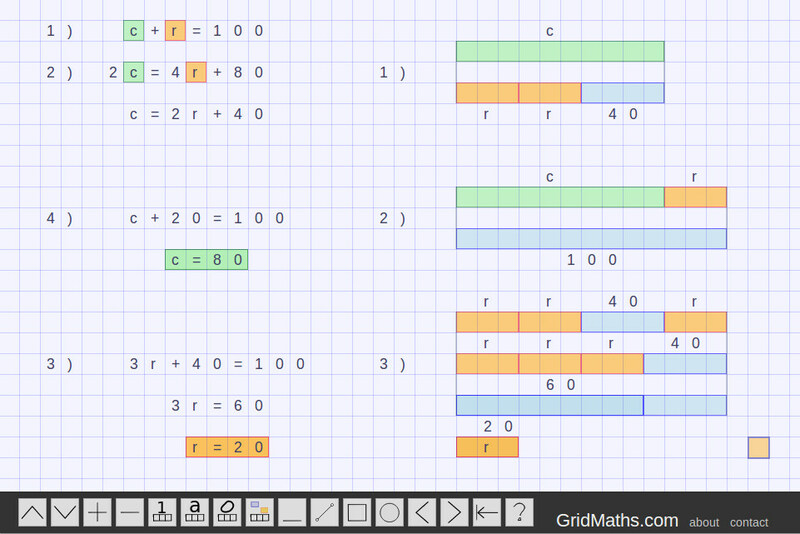 Another way is to have rectangles or lengths and color or shade them differently – this is easy in GridMaths, you just draw color rectangles, or Cuisenaire Rod lengths. Remember to make the point this is not to scale, you cant yet measure off the diagram, the length is standing in for the real length which youll arrive at. Apparently this is called the ‘Bar method’ in Singapore maths – I think its good to have a name so teachers, parents and kids can talk about this approach. Someone asked me about an earlier post, whether it was the Singapore method.. and actually no, I’m not familiar with that method or series of books.. but from what I hear it seems quite good in terms of using visual keys to get the concepts across. 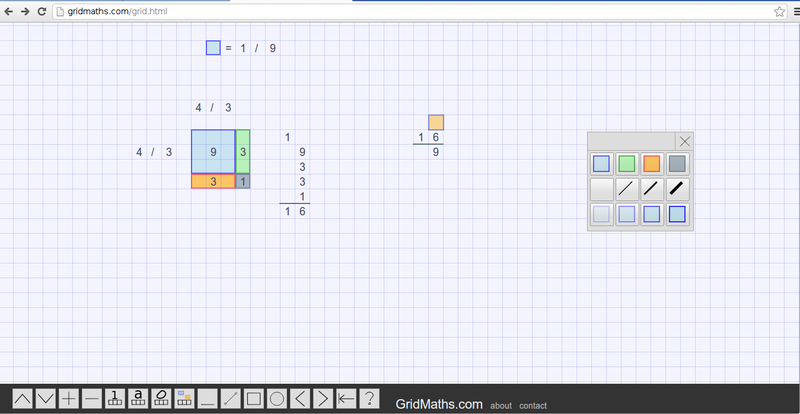 Likewise, I think that using rectangles for multiplication is a huge thing that isn’t done enough. This approach can help reach some learners who see algebra as just wacky rules with no meaning. The great thing about this Visual representation is its easy to work with.. and leads directly to algebra. Once you’ve done a couple, you can just use letters instead of colored lengths and everything works the same way. So its seen as an efficiency, to save making the diagram each time. I was first introduced to simultaneous equations through one of the books of W.W.Sawyer a great teacher of math teachers. I read his book as a youngster and so got interested in Calculus.. he had a wonderful way of making things simple and interesting. He talked about how the average speed of a car over its entire journey was not that important, if you happened to get hit by the car just when it was travelling at its maximum speed. In court you’d want to know the average velocity of the car in the few meters and seconds before the event.. this led directly to ds/dt type discussion. Awesome guy! To compute by hand, or not ? I did enjoy Wolframs video, but I think its too tempting to take away computations.. in doing so we risk losing the math understanding behind them. I just think we need more of both : more understanding and more facility with actual practical problem solving. Technology can help to explain math better. I just found this video today, which contains a superb intro to Bezier curves, among other things. I think this would be pretty engaging to high school students, be a motivation for them to learn calculus. 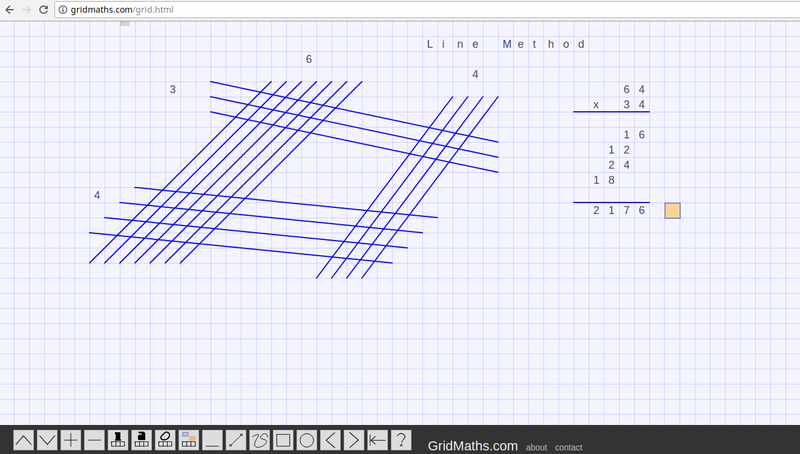 One of the things I wanted with GridMaths is to take some of the pressure off long working out but also have the student solve the problem for themselves. Its easier to line up numbers in long multiplication and you tend to make less typos. 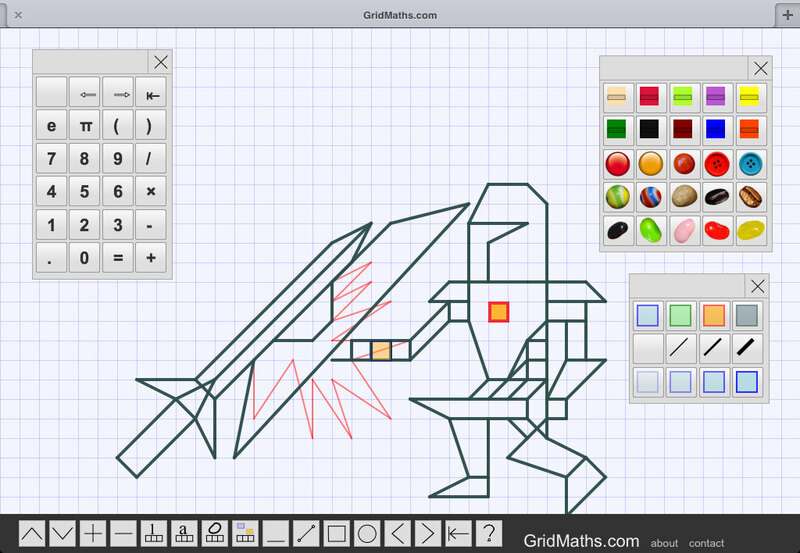 By design, GridMaths is _not_ a calculator, there are other apps that do that well. I’m currently working on a hybrid approach where you can use ASCIIMathML to get good looking math expressions, which should open GridMaths up to wider use at high-school level. Maybe we can make worked problems less of a chore and more about understanding … but still keep the facility and practice with computations at a good level. I can remember an awful lot of fiddling around with sharpening pencils and erasers at school.. push-pencils solved that, but I must have bought 15 different compasses :] Once a person can write legibly, maybe the emphasis should segway from paper to electronic tools, but still keep the ability to do the constructions, structure the essay, think critically, type well, organise computations etc. I recently saw a report from one school where they moved to 1-to-1 tablets, where they saw savings of ~20k/month in stationary costs.. maybe exaggerated and an affluent school, but paper is kind of expensive at volume. Its certainly a lot quicker to make a GeoGebra construction on a tablet, than to do it with ruler, compass, dividers, protractor and pencil … you can concentrate on the concepts and specifics, rather than paper-management. Then the diagram you construct is malleable, you can drag and interact… that’s a big innovation, and helps understanding. I wonder what ways software can help take the load off teachers, so the mechanics are easier for them, and they can spend more time teaching face to face. My son is working on some LCM word problems on Khanacademy. LCM is short for “Least Common Multiple”, this KA vid explains it pretty well. Basically the idea is to take two different measuring rods of two different lengths, start at the same place and keep measuring out lengths of each until the ends match up exactly : the first time this happens is at the LCM. Easier to see than explain, especially if you get kids to experiment by putting rulers end to end, its kind of a nice little discovery, and the kind of open exploration that gives you the cool math-buzz when you discover something yourself. 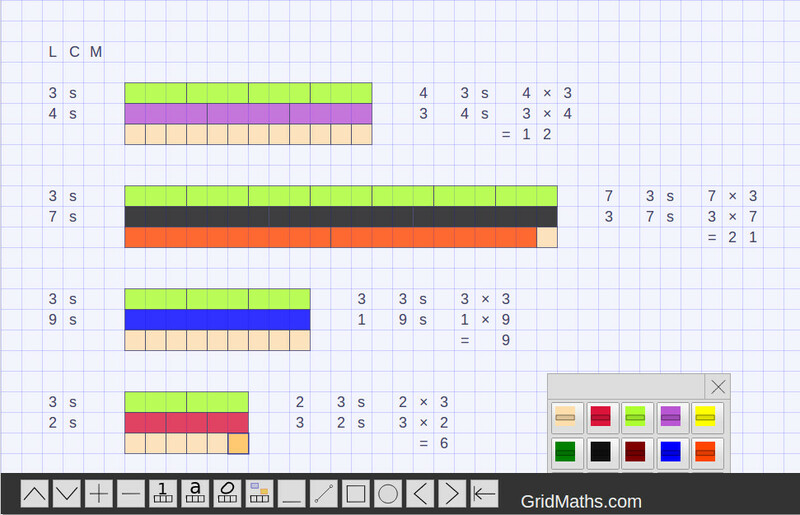 I guess the potential with a software tool, rather than paper, is that you could potentially have Cuisenaire measuring rods of any length [ a set of the first 50 primes would be a nice grab bag of tricks ] … and you could get LCM for larger numbers by just laying down more grid and scrolling to the right. 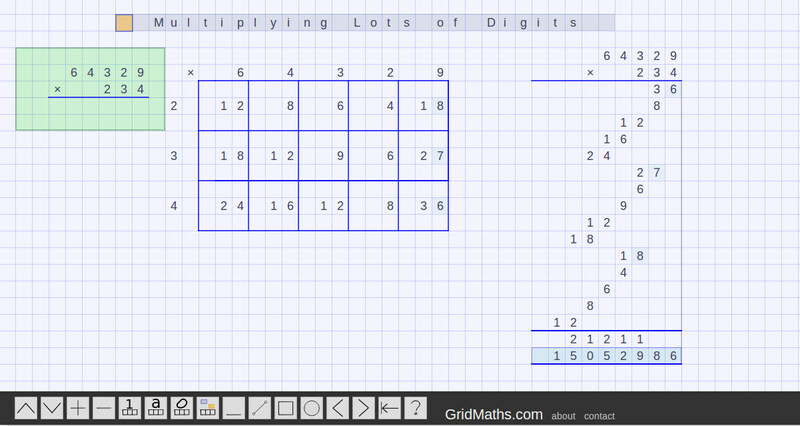 Its early days, so GridMaths doesn’t have this feature yet.. but I really like the fact that its open to doing things like this. Prime Cuisenaire Rods anyone ?